Over the last several months, I've been working on a drainage course built on the 3D GameLab platform. The purpose of the course is to offer people information about drainage and flooding so they can better understand these issues and how to protect themselves and their property. The 3D GameLab framework, developed by Boise State University, is incredible because it gives anyone the opportunity to set up classes and incorporate fun learning elements using almost any online tool. There's also a badge and reward system available. When the class is finished, I'll post a more complete article about the course. But for now, I wanted to share a game I created for one of the course quests (it's also my very first attempt at making a game so it's very simple and basic). It was developed using the Construct2 software and is based on one of their tutorials. The object of the game is for the player to use a blow dryer to prevent a flood by drying up the rain drops. So while the game can offer a fun diversion, it's also designed to demonstrate the futility of fighting a flood without adequate preparation. 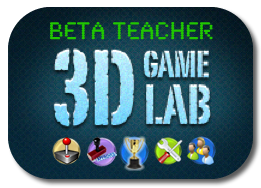 As a result of my participation last year in a course held by Boise State University (BSU), I gained the opportunity to create my own courses using 3D Game Lab – an online game-based learning platform hosted by BSU. My primary goal in doing so was to offer information and resources to citizens in our community in an easy to use and fun format that was accessible 24/7. 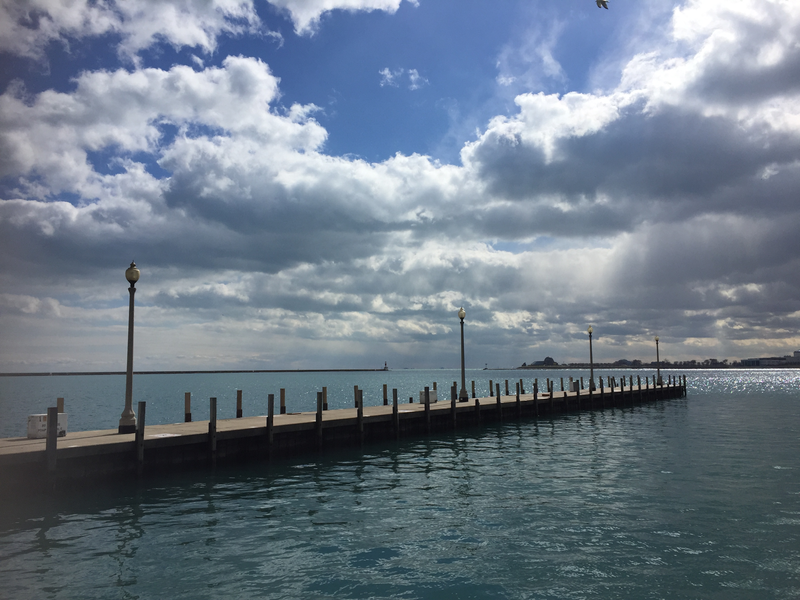 To begin, I chose to create a course on drainage and flooding because this is a topic about which we seem to get a lot of calls or questions. But now as I am nearing completion of the course and getting ready to roll it out for use, I realized there is no good place or centralized location to offer information about serious games designed specifically for citizens. And while regular games have numerous fan sites all over the place where players can talk about the games and exchange ideas and opinions, there's nothing for players or users of these "gov games." So I figured if our city needed a place to promote our game and a place where people could discuss the game and offer feedback, other agencies could probably use something like this too. And how much better it would be if we could all be located in one place. That way anyone interested in serious gaming related to government and community would not have to search all over the Internet. 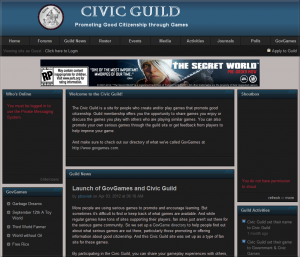 And if there was a type of guild site for these games, people could go there to see reviews of games, discover new games, or just interact with others who are interested in civic gaming. The members of this guild site could also become a type of Civic Guild which might then offer opportunities reaching beyond only online interactions! 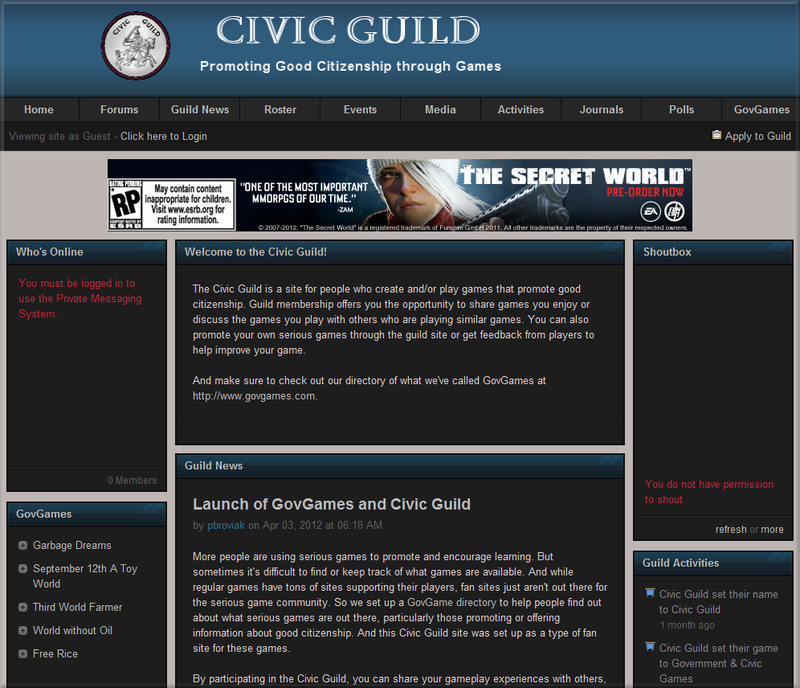 In the end, I was not really sure how much of a need for this was out there or if it would actually work the way I envisioned, but I went ahead anyway and set up a GovGame Directory and Civic Guild site. You can visit the sites by clicking the links below. Because this idea is still somewhat in Beta form, it would be great to get feedback on whether or not people think this would be beneficial, and if so, how the sites could be improved. 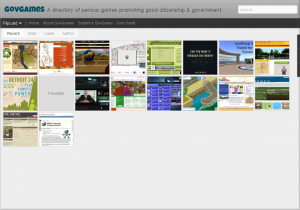 And feel free to submit your favorite GovGames through the directory site so we can add them to the listing. I know I'll be adding ours once it's finally completed. There's been a lot of talk lately about acceptance of failure. Probably because people are pushing for innovation, and it's difficult to innovate if you're afraid to fail. Thus the numerous posts of encouragement across the Internet assuring all of us that failure is ok. Of course as engineers, failure is not something we want to experience. In some cases, an engineering failure can result in loss of life or property damage. So engineers are very careful about eliminating failure as an option. But I suppose, we could consider acceptance of failure in areas of our lives not involving an engineering design. In other words, we should look for those pockets of opportunity throughout our day where innovation with a risk of failure could be an option. Of course, our conservative and analytical approach requires us to ask, why? Why should we do this when our carefully planned and well calculated approach to life works just fine? To answer this, let's take a look at how others fail and the impacts they experience due to that failure. If you have children, it will be very easy to think of how they fail. And it seems that the younger they are, the more they fail. Children are born with few skills and knowledge, but from the time they begin life on their own, they start to search out and learn as much as they can. But this learning process rarely goes smoothly – how many times does a baby fall before he learns to confidently walk? Some parents stand back allowing a certain amount of failure – these are the parents who will say, "let him go; he needs to learn." Other parents hover over their children waiting to rescue them at the hint of trouble. And this approach continues on until they turn into an adult and perhaps for some parents even later. Although I am not sure the same parent takes the same approach every year of their child's life. The one thing I am sure about is we cannot do everything for our child all the time jumping in before the point of imminent failure and save the day then think at age 18 they magically know everything and can go off merrily on their own. They need to learn, and like it or not, they learn through failure. Or they never become fully independent adults. Now, the lesson is not to let your kid go off doing everything without resriction and hope they survive thinking that is the only way they will learn. After all some risks must be avoided, and as parents, we need to monitor the risks we allow our children to take. But not allowing risk at all not only removes their chance of learning life skills, it also conditions their adult behavior. Which kind of makes you wonder if engineers with their ultra conservative approach to life were raised by parents who minimized risks. I don't know – that's for the psychologists to figure out. Now, let's look at what our risk aversion has done to our profession. Yes, it allowed us to continually improve our designs allowing for a much safer and more environmentally friendly world. And that is not something to dismiss – it's an amazing achievement for our society. But could we have done more if we better understood failure and risk and were able to distinguish the "ok to fail" opportunities. We explored the results of not innovating with the rest of the world in the "Does Civil Engineering Have a Next Paradigm?" and in "The Rise and Fall (and Rise Again?) of Engineering Consulting Firms." Perhaps this is why I have been so intrigued by games and 3D environments. I don't want to take risks with what I do at work, so while I create successful projects with this approach, I perhaps miss out on insights provided by failures. But what I have quickly learned using games and spending time in virtual worlds is I can fail there all I want, and no one gets hurt including myself. And by doing so, I learn amazing things. We can never tell engineers working on an actual project to just go ahead and try any pipe size just to see what will happen. But we can in a game or in a 3D virtual world. 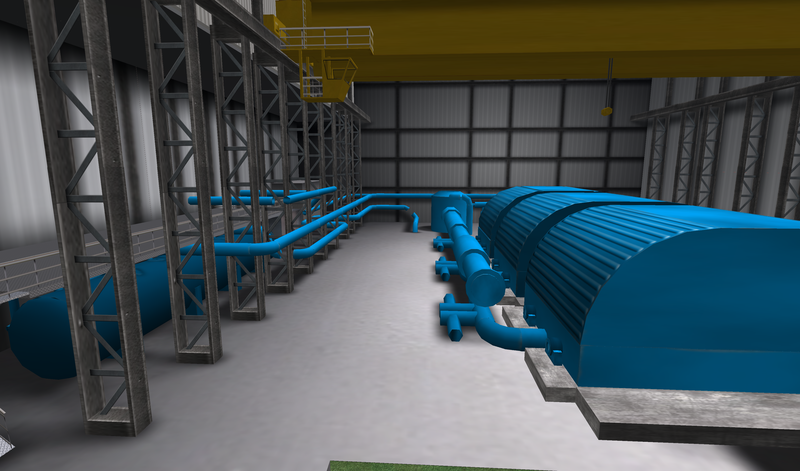 Having a water system or plant set up in a game or virtual world where we could switch out pipe sizes, or pumps, or fittings and watch what happens to the system would provide a great learning opportunity. How much better and faster a hydraulics or fluids lesson would sink in if we could calculate the result then actually try it out in an environment designed to safely allow for failure. The problem with training material is that usually the people creating these documents know their subject matter inside and out. Now, I realize that most people probably wouldn't really think that's problem. After all, if we are new to a subject and looking for a teacher, we would most certainly seek out a "master" of the task or material. So why in the world would anyone think of full and complete knowledge of a particular subject as a liability for a teacher? The reason I say this is that when we have mastered something, such as CAD or GIS or any other task we do every day, we end up going through the motions or steps without really thinking about it. So when we decide to teach someone else, it really takes an effort to stop and think of each and every step we need to explain. I came to this realization when I tried to write some guidance to show someone how to use a certain piece of software. I found out you really need to figure out and write down every single thing you do. If you skip one step, particularly a critical one, you risk losing your student. They end up stuck, not able to proceed because they are missing that one key ingredient. And the teacher preparing such a guide might not catch that one omission because while testing it out, it's easy to go on auto-pilot and fill in any missing steps without really thinking about it or noticing the key step is missing. But had I remembered my earlier experiences playing the text-based game Zork, I would have more quickly understood just what is needed to create a successful training manual. Because just like playing Zork, good training is all in the details. If you've ever played Zork, you will remember how important it was to type out each command in logical order. If you see a bottle of water on the table, you can't just say "drink water." First, you need to pick up the bottle. Then you can issue the "drink water" command. And because it's all text-based, you need to provide your own visualizations of what you have done, where you are, and what you are planning to do. Yes, in a world of video and animation, text can seem boring. But playing through these old games can help us better identify the basic tools and steps that must be incorporated into training in order for it to be successful. Throwing together a flashy video might engage, but will it teach? If we've left out necessary details, probably not. The other day I commented about the reviews written about a street sweeping game. The post ended up on GovLoop where Denise Petet added some great insights on how the game might be made more fun and engaging. She suggested adding more interesting cars, having pedestrians interact with the sweeper, and even allowing the sweeper to temporarily turn into a race car for a few turns around a track. And today having listened to the following TED talk about how video games are developed to keep us engaged, I feel she is on to something. In the video, the concept of randomness and the percentages developers set up in the game for allowing discovery of quest items seem to suggest Denise's ideas will work. I know when I play World of Warcraft it does seem like my behavior is as described in the video. At first I don't mind searching, but as I near my goal, I am happy to realize finding the items seems so much easier. I always wondered if I was just lucky or imagining it, but now I know it's all part of the grand scheme of things! Denise's suggestions could be combined with discovery quests so that perhaps within the game is another game where the driver must log so many sightings of a certain type of car or potholes, or broken inlets, or other similar features that show up based on specific percentages. So the lesson seems to be that as we develop games for learning, we need to try to keep in mind this simulated randomness. And because many of the tasks or concepts we develop training for might be perceived as "boring" by some, it will be important to think of the details related to the task that might be taken for granted and develop them as interesting and engaging features that show up at random. In our sweeper example, perhaps they could have added billboards that change each time the sweeper passes by. Or as the commenter suggested, allow the user to temporarily enter a different reality where perhaps the sweeper turns into a race vehicle for a limited time – I think Donkey Kong uses a similar idea when it temporarily takes you out of the regular game for a quick mini-game. I can just imagine a sweeper all decked-out and revved up racing around a track then transforming back to its traditional mild-mannered public works vehicle. I've never actually ridden in the street sweeper even though I've managed street sweeping operations in the past. But I can certainly imagine what it would be like. Day after day of driving about 10 miles an hour along the edge of every road carefully avoiding parked cars, pedestrians, and bicyclists. 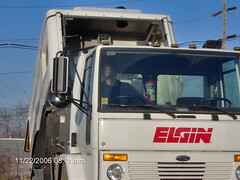 Then driving to the dumping facility to unload the day's collection of debris, washing down the vehicle, and fueling it up for the next day. There's nothing about that to lead me to believe it would be a riveting, jaw-dropping, white-knuckle ride of fun and excitement. But it is a vital function of our operations. The first reviewer seems disappointed that the experience is "boring." While the second reviewer approached it knowing full well it probably wasn't the most exciting job in the world. And each individual expectation seems to have driven the reviewer's opinion of the game. What surprised me was that anyone would think street sweeping was a job filled with action and excitement. Probably the most exciting thing that ever occurred in my 16 years of running the operations was the day the mayor at the time ordered the sweeper, without my knowledge, to come up and sweep the newly laid asphalt road we just paved. I of course did not know of this and had just left the jobsite because all the asphalt was down and the roller was finishing up compacting. I found out about it because the driver of the sweeper called me worried that he was pulling up the asphalt. So of course, I run over there and arrive to a view of the roller still going up and down the asphalt with the sweeper running right behind. You can imagine my reaction and wow do I wish I had a photo of that now! Of course at the time I was too focused on getting that sweeper off the new asphalt to think of taking photos. So I told the sweeper to stop which he was more than happy to do. Anyway, if you're a regular reader of this blog, you know I'm a huge supporter of using games for training. And this game does seem representative of the actual experience. But it brings up the question, do games developed for training have to be exciting and fun to be successful? If not, then perhaps game developers need to do a better job setting up expectations. But if they do have to offer these elements, how can this be done and yet accurately reflect the true experience of the task? And is this an example of why the idea of a back story needs to be better integrated?